Swiss chard isn’t native to Switzerland, but the Swiss botanist Koch determined the scientific name of this plant in the 19th century. The actual homeland of chard lies further south, in the Mediterranean region, and in fact, the Greek philosopher, Aristotle wrote about chard in the fourth century B.C. 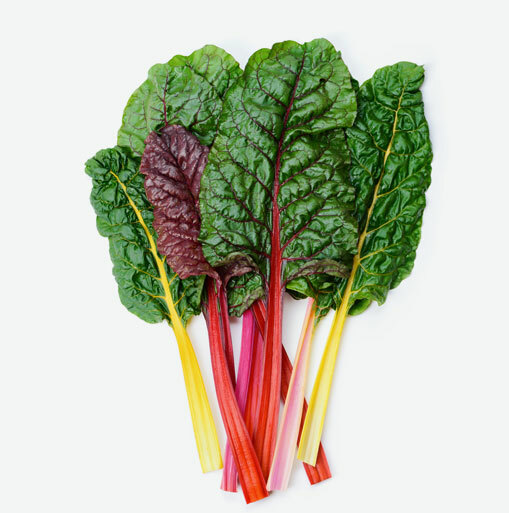 Chard is a tall leafy green vegetable commonly referred to as Swiss chard and scientifically known as beta vulgaris, belonging to the same family as beets and spinach. Chard has a thick, crunchy stalk to which fan-like wide green leaves are attached. The leaves may either be smooth or curly, depending upon the variety, and they may feature lighter-coloured ribs running throughout. The stalk, which can measure almost two feet in length, comes in a variety of colours including white, red, yellow and orange. Both the leaves and stalks are edible, although the stems vary in texture with the white ones being the most tender. Swiss chard is an excellent source of iron, which links with protein to form the oxygen-carrying molecule hemoglobin. Iron helps to keep the immune system healthy and helps your body produce energy. Swiss chard is also a good source of magnesium, which helps regulate nerve and muscle tone by balancing the action of calcium. Insufficient magnesium can contribute to high blood pressure, migraine headaches, muscle cramps, tension, and fatigue. One cup of cooked Swiss chard delivers about 20% of the daily required value of iron, 35% of magnesium and 10% of calcium. Look for leaves that are a vivid green colour and that do not have browning or yellowing. The leaves should not be wilted, nor should they have tiny holes. The stalks should look crisp and be unblemished. When storing Swiss chard, place the chard unwashed in a plastic bag in the refrigerator where it will keep fresh for several days. If you have large batches of chard, you can blanch the leaves and then freeze them. Wash the chard well to remove any sand or soil that may be hidden in the leaves. Trim the bottom end of the stalk. If you find the stalks to be more fibrous than desired, make incisions near the base of the stalk and peel away the fibers, like you would do with celery. Do not cook chard in an aluminum pot since the oxalates contained in the chard will react with the metal and cause the pot to discolour. Since the stalks are thicker in texture, they take longer to cook than the leaves, so their cooking should be started a few minutes earlier. Chard is one of the vegetables that requires quick boiling (as opposed to steaming or sautéing). Use Swiss chard in soups, salads, alone as a side dish, or in lasagna.